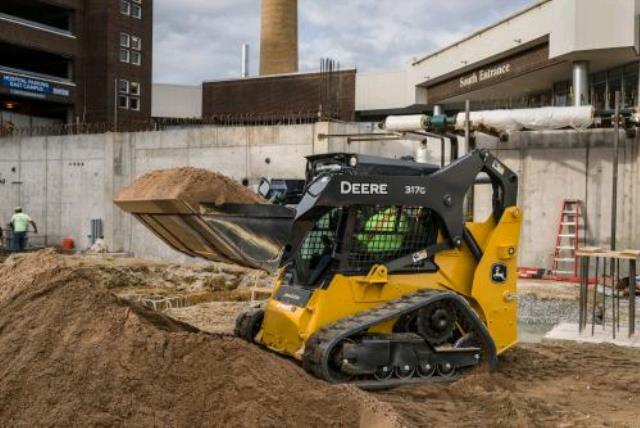 John Deere COMPACT TRACK LOADERS offer superior pushing force,lifting,digging and minimal ground disturbance compared to rubber tired loaders. Rubber track loaders perform well in soft,sandy,wet or muddy conditions. This 317G has a 66" bucket and an operating capacity of 3032 lbs at 50% of tipping load of 6070 lobs. Lift Height to bucket hinge pin 10'1"
DUMP HEIGHT, LOADER ARM AT MAX HEIGHT: 7'5"
HEIGHT TO TOP OF ROPS: 6'6"
OVERALL LENGTH W/BUCKET ON GROUND: 11'5"
* Please call us for any questions on our loader track jd 317 rentals in Portland OR, Gresham OR, Milwaukee OR, and surrounding metro area.